What? in a Names That Which We Call a Rose? 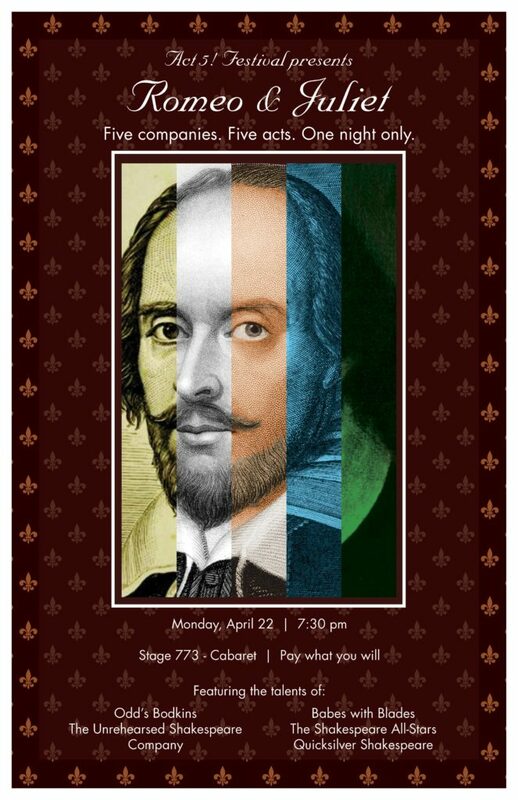 – Unrehearsed Shakespeare Co.
What? in a Names That Which We Call a Rose? It’s one of the most famous lines in the English-speaking world, and a pretty profound statement on the value of labels when compared to the sensations provoked by ‘the thing itself.’ All the more profound, perhaps, in that it’s been spoken by a thirteen-year-old character, besotted by love, whilst the much older object of her love can think of little other than body parts and the unintelligent objects to which he compares them. These sorts of puzzles come up all the time in the First Folio, and most of them have pretty universally accepted solutions, agreed upon by most scholars. And admittedly, what I’m about to suggest may be a little difficult to follow for some middle-school students, first being introduced to Shakespeare in some mind-melting classroom. Such students are, ironically, probably a bit older than Juliet, but then she’s a fictional. Anyway: the original phrase, “What? in a names that which we call a Rose,” would seem to demand some kind of interpretation, no matter how conventional or inventive. A question mark followed by a non-capitalized word is often interpreted as signifying inflection. 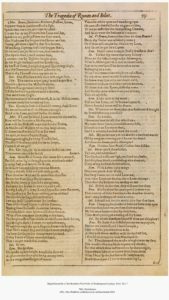 Ian Richardson (and many other famous Shakespeareans) refer to the First Folio as “an actor’s punctuation,” in that punctuation is often used to indicate breath and intention, rather than grammar. More importantly, there is little if any evidence here to demand that we make “What? in a name” it’s own, standalone sentence. A slightly more purist interpretation might be: “What in a name’s that which we call a rose?” That is: ‘Where, in the word ‘rose,’ can we find the thing itself that we call a rose?” What in that word (if anything) codifies the essence of the thing itself? Nothing, presumably. This isn’t enormously more profound than the more conventional interpretation. And after all, it still requires some non-purist interpretation; there’s no hard evidence that “names” is intended to be “name’s” rather than “name.” And I’m sure I’m not the first one to suggest it (though both Arden and Oxford are disappointingly mum on the subject). I do think it adds more nuance to what Juliet is saying, however, and if nothing else it’s a refreshing take on a well-trod line. The fact that she discusses the concept not only of infinity, but of multiple degrees of infinity, later on in this same scene whilst in the presence of her first crush, would seem to support the idea that Juliet can handle the more intellectually-dense interpretation of a line. And I think that’s pretty neat. And hey! You can check out this line and others just like it at Act Five Fest! Copyright © 2019 Unrehearsed Shakespeare Co.